Everglades Restoration: Despite consensus on the importance of Everglades restoration and c.$5.8 billion already invested by federal and state governments, key recovery efforts for the 47,000 sq. km (18,000 sq. mile) Everglades ecosystem of S. Florida were stuck and mired in litigation. Competing interests, divergent stakeholder opinions, authority vested in multiple agencies and tribes, and apparent conflicts in science came together around one question. Will restoring the habitats for one group of endangered species (protected by law) lead to the extinction of others? The survival of 68 species was at stake and the restoration was polarized. The US Dept. of Interior asked for our help in order to help break the impasse. Working with the key agencies, the Restoration Task Force, and each stakeholder group to identify their concerns and opinions, we assembled an expert scientist panel and convened several meetings of policy makers and stakeholders. We set up a public process where the science was presented by all scientists working on the issues, and was debated openly among policy makers and stakeholders. The results included a clear set of guidelines from the panel for next steps in restoration, identification of the areas of scientific uncertainty which helped to highlight management confidence and risks, and a critically important blueprint for how to manage endangered species through restoration. Most importantly, the restoration steps moved forward. Number of Projects - 3. Testimony to the success and quality of our work our involvement in subsequent issues was requested by the parties. The US Army Corps of Engineer (USACE), in cooperation with US Fish & Wildlife Service, Missouri Department of Conservation, Nebraska Game and Parks Commission, US Geological Service, University of Missouri, with input from South Dakota, Iowa, and Kansas, requested that we conduct several independent scientific reviews (ISR) for the endangered Pallid Sturgeon, habitats and management in the Missouri River Ecosystem. This included the population assessment program, habitat assessment and monitoring program, models and linkages for hydrological and biological processes; the USGS Comprehensive Sturgeon research program, and captive breeding (hatchery) recovery efforts. 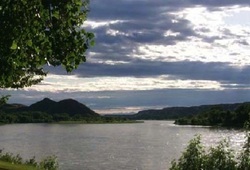 The longest river in N, America, the Missouri River flows for 2,341 miles (3,767km) before joining the Mississippi River. It’s watershed (2.5million square miles or1,200,000km square) drains10 U.S. states. 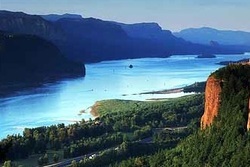 Irrigation, flood control, hydro-electric power, channelization, and agricultural development have collectively affected the river, and sediment flows. Fish and wildlife populations, water quality, and ecosystem stability itself have suffered. This in turn has affected the communities who depend on the river. Among the most critically endangered species is the pallid sturgeon and it’s decline has been closely linked with human activities. With so much at stake, management and recovery of endangered species and the river system has been controversial and complex. Controversy over biological opinions, regulations imposed on human activities including government agencies, the involvement of multiple-states, and questions on the efficacy of recovery actions were among key factors in the debate. At the request of the USACE (the main agency implementing restoration/recovery projects) we convened an initial science panel to begin to address some of the more pressing and contentious issues. We evaluated the status, monitoring and recovery efforts for the pallid sturgeon. The low numbers made it difficult for scientists and agencies to assess the true situation. Drawing together the federal and state agencies, and the research biologists on the ground we were able to help create a strong conceptual model, provide assistance in the design and analysis of field efforts so that information could be used in assessment, and help in the overall recovery work. For another project we assembled a team to assess the research and recovery efforts. This included captive breeding and hatchery efforts for their role in helping to recover the critically endangered sturgeon. Number of Project 3 and USGS review- Testimony to the success and quality of our work clients requested our involvement in subsequent issues and projects. The sand dunes community ​at Gouverneur Beach St Barthelemy one of the most important beaches on the island, was severely degraded. The once lush vegetation was mostly gone and the beach was eroding. We designed an innovative sand dune restoration that was based on our knowledge that plant architecture is the foundation for stability of sand on the beach, and can buffer the coastline against storms. The ecosystem was so badly degraded that we knew we did not have sufficient time for a natural recovery (c 20 years). We developed an innovative process to restore a mature sand dune ecosystem in less than 18 months. Our efforts were successful and the restoration has withstood 5 major hurricanes or storms, and provides for a beautiful beach for visitors and privacy for owners. Visit the project page. Dr Don Boesch U. Maryland. Dr Jim Quinn, U. California. Science and Disaster Risk Reduction and Resilience in Natural disasters. In the aftermath of the SE Asia tsunami, we recognized that thousands of people’s lives would be affected by the impact of the disaster on their natural resources. Debris along the coast and in the sea itself was a major problem and it threatened reefs, fisheries, and people. Fishing nets torn from their moorings and wrapped around reefs and rocks posed a threat to fish and turtles that became entangled in them. In several areas, especially more remote locations fishermen returned empty handed, leaving them without sources of protein or income. The more stressed natural resources and habitats suffered dispropotionaly in the disaster. Dr Brosnan mobilized the groups network of marine scientists who responded immediately, partnered with PADI and Project AWARE to link scientists, PADI/AWARE divers and the local communities who needed scientific and personnel help. She herself traveled and worked in the region and built additional partners including IUCN and Sri Lanka’s Center for Conservation Research. 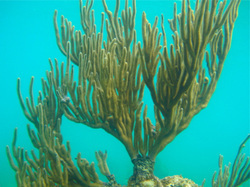 Several projects subsequently evolved into joint academic and community coral restoration and research efforts. Dr Brosnan briefed and advised government and international agencies (e.g. U.N.). In addition to the on the ground results, the work resulted in several reports, briefings and a peer-reviewed paper. Tsunami planning and disaster risk reduction in coastal and ocean areas continues to be a main focus for us in several current projects (on main site). VOLCANO, OCEANS AND PEOPLE. Montserrat Volcano. The island of Montserrat faced a dificult choice. To build an emergency port in the pristine location, or to risk that an volcanic eruption would destroy the main city, port and airport and leave the island helpless and cut-off. Building a port would potentially destroy the fishing and tourism coral reefs on which the economy and individual lives depended. We were asked for help in finding a solution. We worked with the island’s government and NGO community to help establish a local stakeholder team. Our scientists carried out essential biological assessment. Based on the scientific conclusions we were able to identify the risks and consequences. We engaged the stakeholders, government, and engineering teams on the science and on finding a sustainable solutions that would meet their needs. It was clear that something had to be done as the natural disaster risks were high, but so too were the risks to the natural resources. Their question was whether it was possible to meet human and natural resource needs. We worked to find a unique jetty design that would ensure that vital habitats were protected. As part of the effort, we “moved” and restored a coral reef that was at risk from the jetty. Within 24 hours of relocation hundreds of small fish had taken up residence on the new coral heads. We used the opportunity to educate and train local people on the science and monitoring. Shortly after the completion of the project, the volcano erupted violently. As had been feared, the main town, original port, and the airport were buried under ash and destroyed. The new port was the only access. It has continued to serve the needs of the people and the reefs have continued to thrive providing food, dive sites, biodiversity, and tourism services. - Mobilizing the team and leveraging the best scientists and expertise needed to solve the issue effectively and in a timely way. - Facilitating the right process, and using our methods to define the state of the knowledge, or best available science, the uncertainties and the risks and the solutions this information presents. - Results. Facilitating solutions and options that are practical and doable. We know that every project is unique, Our clients have pressing challenges and often very little of the kinds of information they need. We focus on the underlying issues and the details so the problems can be solved. Often the issues are not immediately apparent and we work to get to the heart of the matter saving time, money and frustration. For instance, a client approached us feeling that they needed experts on species biology. Working with them, the agencies and parties involved, we recognized that habitat and process expertise would be critical to a swift solution. We engaged those top experts and had the problem solved in a few months - prior to our engagement it had been lingering and controversial for some years. In another case, it was apparent that population modeling would provide key guidance to the agencies regarding their decision on an endangered species. We quickly identified the appropriate expert, commissioned and oversaw the work, and facilitated the translation of the result to the agencies so that they could incorporate it into their deliberations and decisions, and which they did to the satisfaction of all. © 2010 by Dr. Deborah Brosnan. All rights reserved.